What is the dynamic range of an image? The sample shown here, which is not uncommon, shows a range of over 2300 to 1, or about 11 bits (2 to the 11th power), or 11 stops of intensity range. 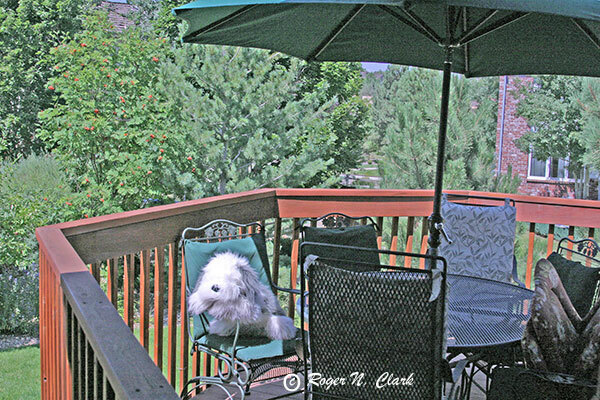 A test image was made showing a deck, some trees, some objects in shadow, and a white stuffed animal in full sun. What is the dynamic range from the darkest darks to the brightest highlights? 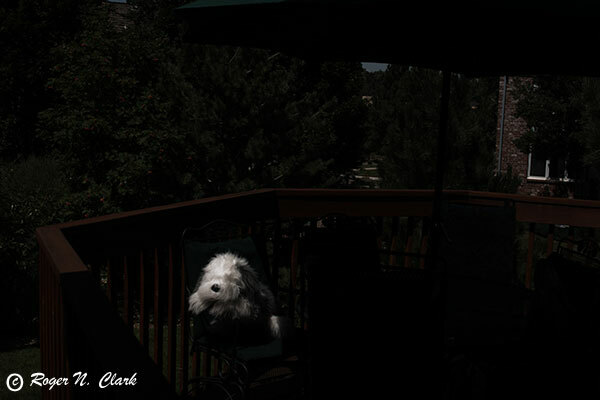 The images were recorded with a Canon 10D camera in raw + jpeg mode at 77 degrees F, ISO 100, Canon 28-135 mm zoom at 28mm. 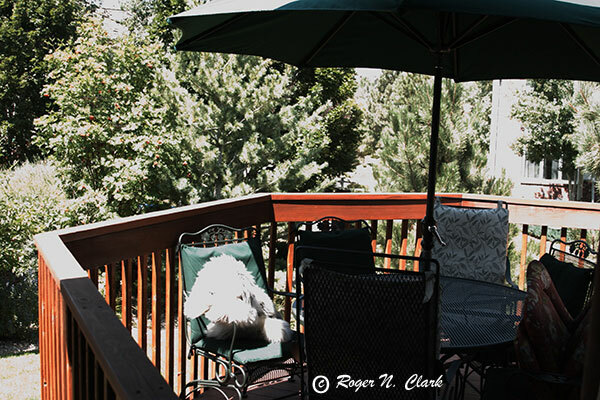 The image shows a large dynamic range that does not display well in any one exposure. Exposures were obtained from 1/30 second to 1/4000 second to be sure the darkest areas were recorded above the noise floor, and the brightest portions did not saturate. Figure 1. This image was converted to 16-bit linear tiff and then with the photoshop shadow tool increase the shadow levels 3 times, with a setting of 100, then 100, then 50. Contrast is very low but it illustrates everything that is in the image. Figure 2. This image was converted to 16-bit linear tiff from a 1/2000 second exposure. In photoshop, the highlights have a max value of 27,580 DN (55160 in ImagesPLus 16-bit unsigned integer).. Figure 3. This image was converted to 16-bit linear tiff from a 1/125 second exposure. Many portions of the scene are above the maximum DN of 32767 in Photoshop. In photoshop, the darkest portions of a 1/30 second image have DNs around 924. Figure 4. This image was the best overall jpeg, a 1/2000 second exposure. The photoshop shadow tool increase the shadow levels 2 times, with a setting of 100, then 50. Contrast is very low but it illustrates everything that is in the image. The highlights are clipped. The original 16-bit image, the lowest values had a value of 12 with a standard deviation in an 11x11 pixel box of 12 (in photoshop) (24 with a standard deviation of 24 in ImagesPLus). This corresponds to an image with a recorded dynamic range of 27580/12 = 2298, almost the same as the extrapolated dynamic range from the 1/30 to 1/2000 second exposures. Figure 5a. Jpeg image values plotted against 16-bit linear image values shows the jpeg transfer function (the default contrast on the 10D). Note that the jpeg saturates at about half the level of the 16-bit data. The 16-bit file has a greater than 1 stop increase in dynamic range before data saturation compared to the jpeg image. Figure 5b. Log jpeg image values plotted against log 16-bit image values from Figure 5b. The jpeg image has less dynamic range recorded (the lows and highs are clipped), and less signal to noise. While the low end of the jpeg is close to linear, the Jpeg has only 50 integer levels while the 16-bit tif image has about 1880 integer levels over the same intensity range, or about 37 times finer intensity detail. Toward the bright end, the 16-bit tiff image has even more detail than the low end of the jpeg image. For example, in the jpeg data from DN 337 to 247, the 16-bit image goes from 22800 to 25200 or 2400 DN. Thus the 16-bit tiff imge has 2400/10 = 240 times the intensity detail! How Complex is this typical image? The plots below show a traverse across the image to illustrate the intensity variations. Two plots are shown, Figure 6a shows scene intensity (on a 0 to 65535 DN scale) and the other in relative photographic stops. This traverse shows over 10 stops of intensity. The traverse is like having a spot meter measuring 2000 spots, each less than 2-arc-minutes in diameter. The full image is like having a spot meter with over 6-million measurements of the intensities in the image. Figure 6a. A traverse across the image shows the complexity from pixel to pixel. Figure 6b. The same traverse as in Figure 6a, but converted to relative photographic stops. This shows the scene has over 10 photographic stops of intensity range. If the traverse went over the darkest portion of the image, it would show another two stops lower, or over 12 stops of scene intensity! Real scenes can have more than 10 stops of dynamic range. Nearby positions in an image often have 4 to 8 stops of dynamic range (factors of 32 to 256). I'm going to record raw files more often! Also, see the article Dynamic Range and Transfer Functions of Digital Images and Comparison to Film which shows that digial cameras have a dynamic range of over 10 photographic stops (a factor of over 1000) while film has only 5 to 7 (factors of 32 to 128). Dynamic range is defined as maximum intensity / minimum intensity, where intensity is scene radiance. For a sensor, like in a digital camera, the minimum is usually limited by noise. Thus the dynamic range that can be recorded by a sensor can be smaller than actual scene dynamic range. In the test case here, they are close to the same.